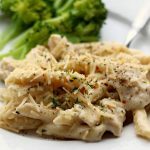 A creamy parmesan garlic sauce envelopes penne pasta and bites of chicken. A quick family dinner made in your electric pressure cooker. Turn your Instant Pot to the saute setting and when it says HOT add in the butter. Swirl the pot around until butter is melted. Add in the chicken and salt and pepper and garlic. And just lightly saute for only about 30-60 seconds. Be careful not to burn the garlic. Add chicken broth and penne. Cover the pot and secure the lid. Make sure the valve is set to sealing. Set the manual/pressure cook button to 3 minutes. When the time is up let the pot sit there for 5 minutes and then move the valve to venting. Remove the lid. Turn the Instant Pot to the saute setting. Stir in the half and half and parmesan cheese. To thicken the sauce stir 1 Tbsp cornstarch together with 1 Tbsp of cold water and then stir the mixture into the pot. The sauce will thicken up fairly quickly. Give a couple shakes of kosher salt and freshly ground pepper into the pot. Scoop onto plates and enjoy! If desired top with a little parsley and red pepper flakes. This recipe makes no more than 4 servings. You can easily double this recipe. Just double all the ingredients and keep the cooking time the same. I prefer thighs for this recipe because they stay more tender than breasts. You can also leave out the chicken! Just saute the garlic by itself and add in the rest of the ingredients. To make gluten free: Double check the chicken broth to be sure it does not contain gluten. Substitute noodles for GF noodles and decrease cook time by 1 minute.